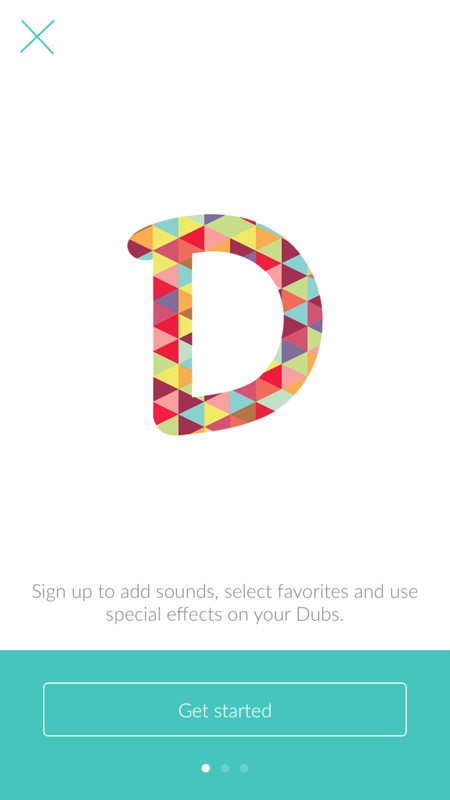 Dubsmash is a video messaging application that allows users to film videos of themselves lip-synching to audio clips. The app was created by Berlin-based app development studio Mobile Motion and released for Android in October 2014 (the iOS version was released the next month). According to the developer, the app has achieved more than 50MM downloads across 192 countries. The app’s first-time user experience is extremely fluid, and it has no “tutorial” to speak of: immediately upon opening the app, the user is presented with popular tracks to record over (via a “trending” tab) and can browse through tracks within a category listing as well as a “discover” tab. Clicking on a track allows the user to lip synch over it, and the lip synch is captured from the device’s microphone and front-facing camera. All of this can be done without registering; users are only prompted to register if they try to add effects to their recording and when they attempt to share their completed track. For registration, the app collects the user’s email address and prompts them to create a user name and password (and also to input their date of birth; users must be 14 years old to use the app). 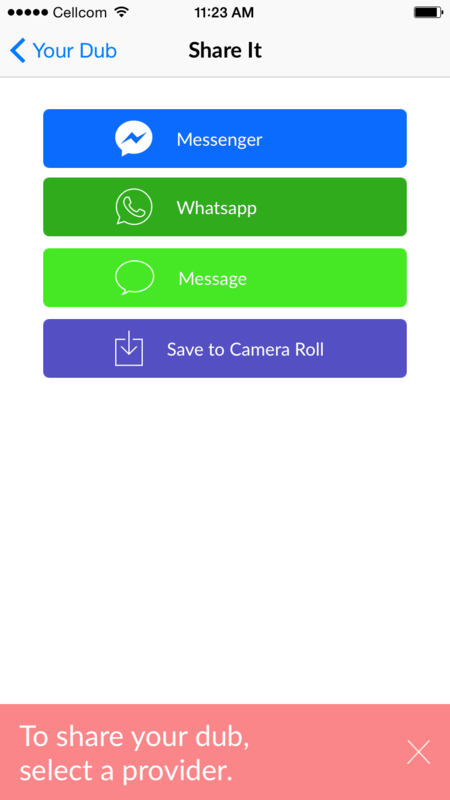 Once registered, users can share their recorded lip synch tracks via Facebook Messenger, WhatsApp, or native messaging. No additional, service-specific authentication is needed to share a track. Dubsmash is unarguably a viral sensation, having reached the #1 top downloaded position 71 countries for iPhone and 21 countries for Android. (edit: via email, the developer confirmed that it has not spent anything on marketing; all installs were the result of organic and viral discovery.) The app currently sits at position #9 on the top downloaded chart on iPhone (US / overall) and has remained in the top 20 fairly consistently since late January 2015. 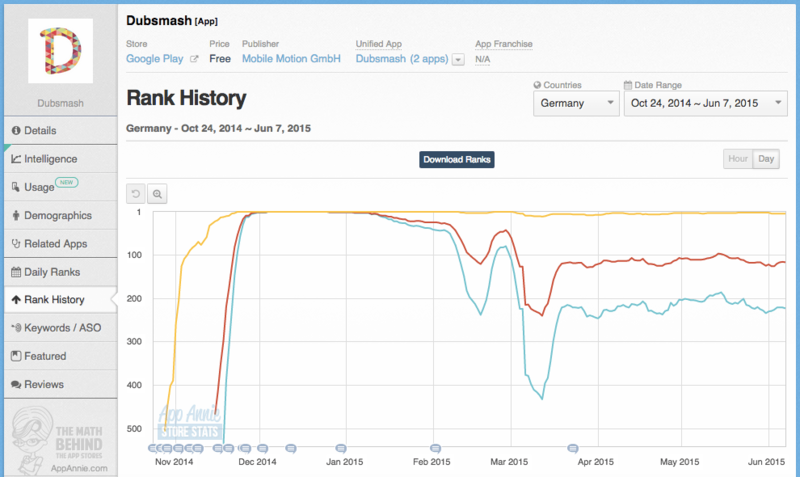 Dubsmash’s viral growth materialized in the developer’s native Germany; the app reached the #1 top downloaded position on Google Play a little more than a month after launch and #1 on iOS less than a week after launch (although the app had been live on Google Play for more than a month at the time of the iOS release). 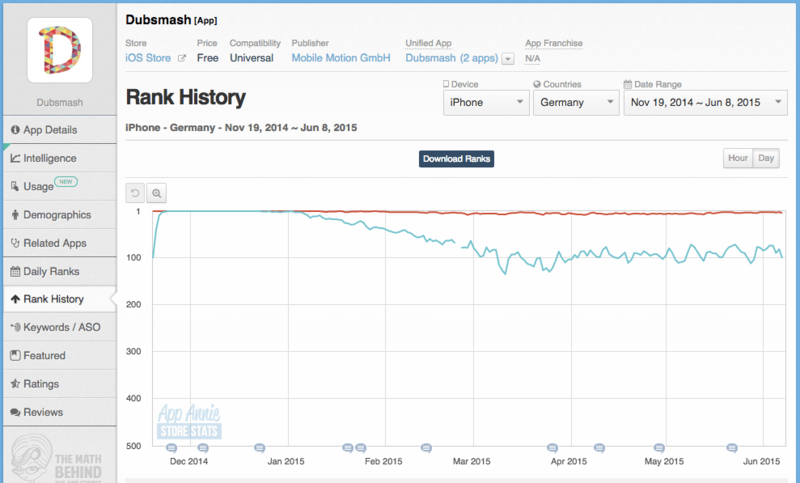 On Google Play, the app appeared to have been a Germanic sensation ahead of wider European popularity: on December 2nd (a little more than one month after launch on Android), the app sat in top 20 positions in Germany, Switzerland, and the Netherlands yet hadn’t breached the top 100 in either France or the United Kingdom. 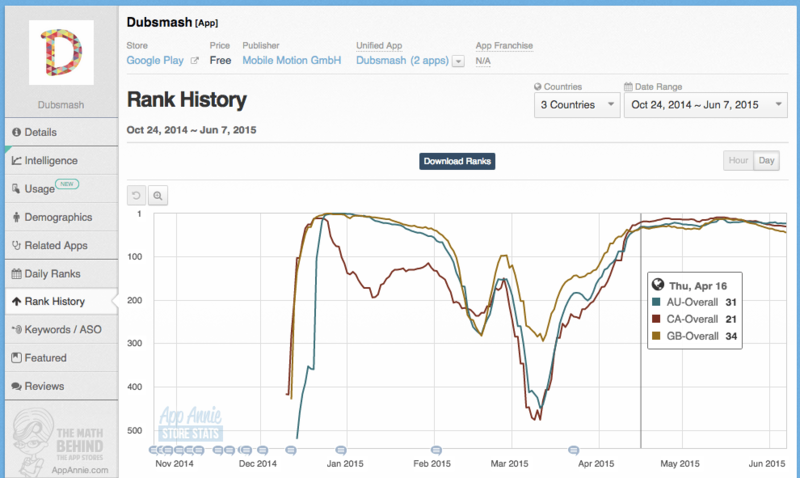 Dubsmash broke into the top 20 in France more than a week later on December 10th and nearly two weeks later in the UK on December 20th. 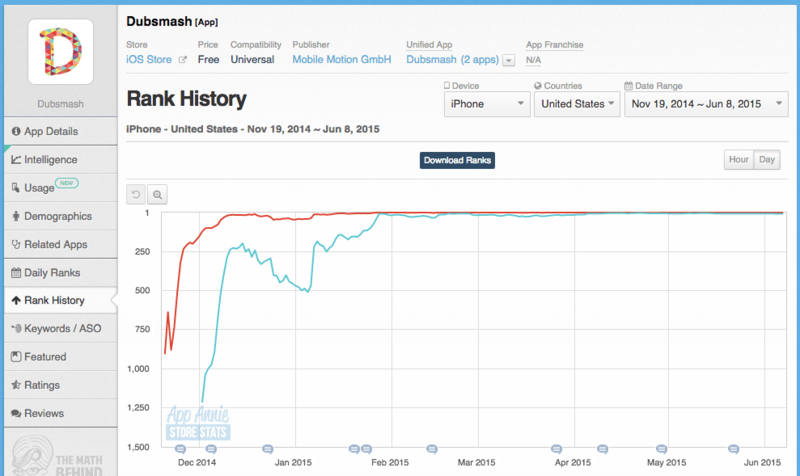 The app broke into the top 20 in the US four months after launch, on February 24th. 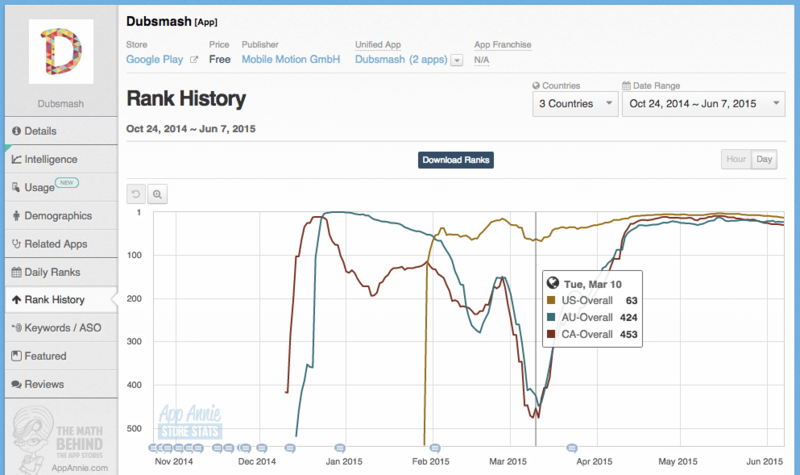 Interestingly, Dubsmash reached initial popularity on Google Play in Canada and Australia at around the same time as in the UK, breaking into the top 20 in Canada on December 20th and in Australia on December 23rd. But the app’s popularity in those countries waned quickly, and it fell out of a top 20 position in both by the middle of January 2015. 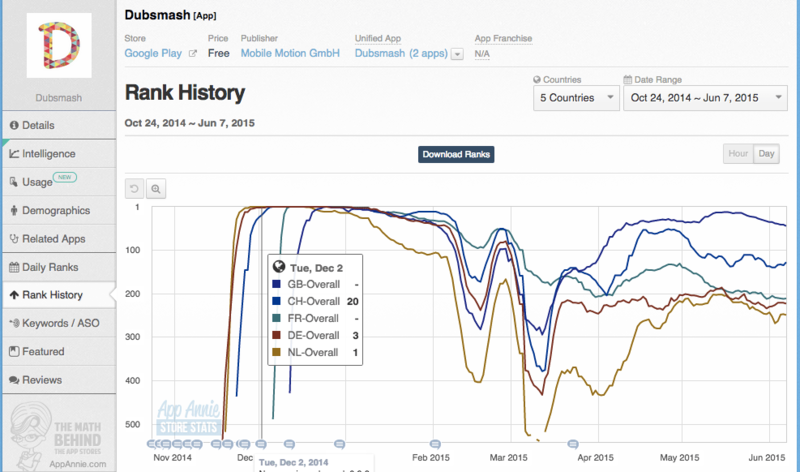 The global growth pattern of Dubsmash, and especially its corresponding dual peaks in the Commonwealth countries, reveals the same interesting insight as did that of Trivia Crack: that penetrating pre-existing networks of people can accelerate popular adoption. In the case of Dubstep, concurrent growth in the Commonwealth countries is unrelated to growth in the US, despite a common language; this could be a result of sharing within the English diaspora. Similarly, the pattern highlights the role that geographies can play in viral growth: as with Trivia Crack, Dubsmash’s popularity emanated from the home country of its developer and took time to traverse the Atlantic Ocean (albeit, with Dubsmash, in the opposite direction). Intuitively, this makes sense, but given the global nature of the app economy, the time needed to cut across physical distances is curious.